USD had a top collegiate finisher in all but two events at the Sioux City Relays on Saturday. Sophomore Landon Kemp became the third Coyote this season to break the 14-foot mark, and only the fifth in USD history. 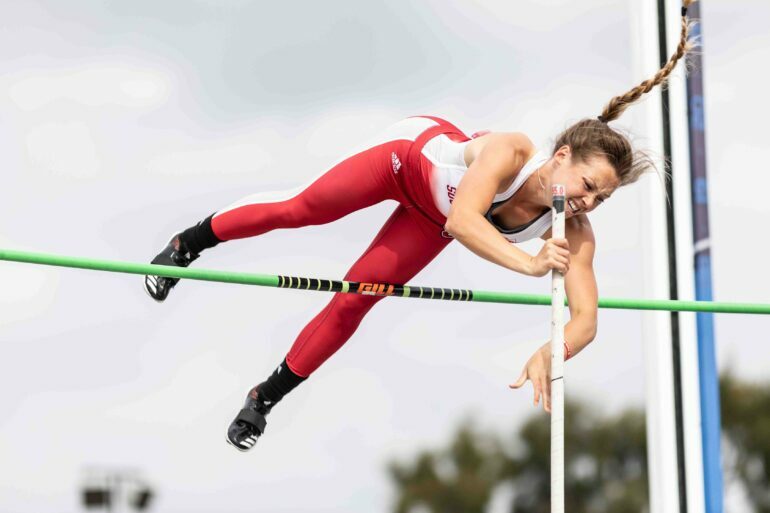 Kemp, who vaulted 14 feet, ¼ inches to win the event, moved into 10th place in the NCAA with her mark. She joins teammates junior Helen Falda and senior Kimmy Peterson in the top-10 for the country. This is the first time in school history three 14-foot vaulters are together on the same roster, according to GoYotes. Freshman Josephina Wright also finished second in the event at 12-1 ½. Junior Nick Johnson took home the men’s pole vault, clearing 16-5 ¼, while senior Kaleb Ellis snatched third with the same height. USD’s pole vault squads are two of four South Dakota squads ranked top-three in the NCAA, with the men ranked first with an average height of 17-6 and the women ranked second, averaging 14-0 ½. USD’s men’s high jump squad is also ranked second nationally with an average height of 6-10 ¾, while the men’s discus group is ranked third nationally with an average distance of 174-11. Sophomore Morgan Lawler won the sole women’s distance race of the day, finishing the 5,000 meters in 17:46.81. Classmate Laura Nelson finished runner up to Lawler in 17:53.02. Senior Hunter Paulsen was victorious in the 3,000-meter steeplechase, finishing in 9:52.72. All three men’s throwing events for the day were captured by Coyotes. Senior Ben Hammer, who is one of four Coyotes to throw the shot put farther than 60 feet, won the shot put at 58-3 ¼. Senior Ethan Fenchel marked at 199-0 in the hammer throw to take first, while sophomore Matt Slagus finished in third place for the event at 175-10. Sophomore Jackson Coker took home discus with a throw of 154-11. Sophomore Callie Henrich won both the discus and the shot put on Saturday. Henrich launched the disc 149-6 and the shot put 47-9 ¾. Classmate Leah Dusterhoft finished second in the discus at 143-11. Senior Lara Boman was the top Coyote and second overall in the hammer throw, marking at 190-3. USD will split time between meets in southern California, Ashland, Ohio and Northwestern College in Iowa this week.